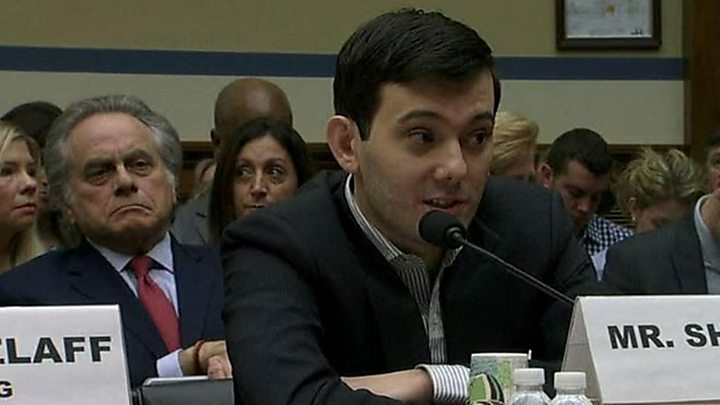 Martin Shkreli, former head of Turing Pharmaceuticals, refused to answer questions at a US congressional hearing on the company's drug pricing policy. He invoked his constitutional right against self-incrimination, but sniggered through questions from representatives. Congress is investigating Turing's 5,000% price increase of a drug, Daraprim, used by many AIDS patients. Mr Shkreli asked Congress for immunity last month in return for his testimony. The Federal Trade Commission is also investigating whether Turing violated anti-trust laws when it raised the price of Daraprim. Turing purchased the patent to Daraprim for $50m in July, but the company and its outspoken former CEO rose to public attention in August when price of a single dose jumped from 13.50 (£9.22) to $750. Politicians, including Democratic presidential candidate Hilary Clinton criticised the company for the increase. Mrs Clinton called Turing's move "outrageous" and called it "price gouging". In response Mr Shkreli said the media and politicians did not understand the pharmaceutical industry. The industry's main lobbying group, PhRMA, also spoke out against Turing's actions. In a statement PhRMA said that Turing "does not represent the values of PhRMA member companies." Other members of the pharmaceutical industry, including the head of Valeant Pharmaceuticals, were also asked to testify. Valeant increased the price of Isuprel, a drug used to treat slow heart rate by 500% and Nitropress used to treat hypertension by 200%. After the hearing Mr Shkreli's attorney told reporters that Mr Shkreli, a former hedge fund manager, was a "brilliant scientist who had saved many lives." Mr Shkreli who is active on social media had already tweeted he would not answer questions. Before the hearing Maryland Representative Elijah Cummings called the decision to invoke his Fifth Amendment right against self-incrimination a "juvenile tactic". At the hearing Representative Cummings said, "You can go down as the poster boy for greedy drug company executives, or you can change the system." After the hearing Mr Shkreli returned to Twitter to call the members of Congress "imbeciles". Turing's chief commercial officer Nancy Retzlaff did answer Congress's questions. She told the House hearing that Turing acquired Daraprim because it was "priced far below its market value" and that the company planned to invest the profits from the price hike into research and development of new treatments. Mr Shkreli stepped down as the head of Turing in December following his arrest on separate charges. The Department of Justice and Securities and Exchange Commission have charged him with defrauding investors at a company he previously ran and a hedge fund he managed.